UPDATE: this work has been cancelled and will be rescheduled for a future weekend. Heads up, Blue Line riders. 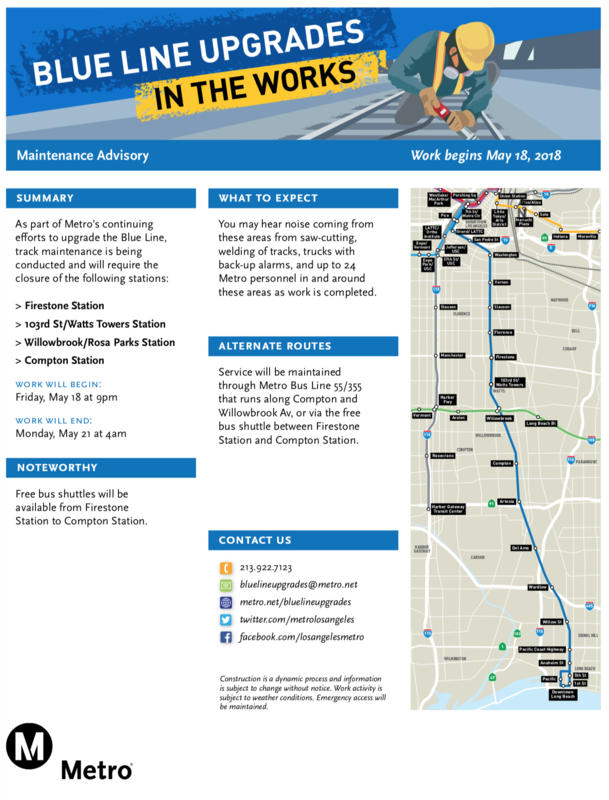 There will be no Blue Line service between Firestone and Compton Station this weekend starting Friday, May 18 at 9 p.m. through 4 a.m. on Monday, May 21. During the closure, crews will be performing track maintenance. Free bus shuttles will replace trains between Firestone and Compton Stations throughout the closure. This means all southbound trains will travel as far as Firestone Station and turn back to DTLA. The last stop for all northbound trains will be Compton Station. From there, trains return to Downtown Long Beach. The Blue Line is scheduled to run every 12 minutes while work is in progress and shuttles will match train service as best as possible. Please allow extra travel time to transfer between the train and bus shuttles. Metro personnel will be at the affected stations to lend assistance. Regular train service will resume with start of service on Monday, May 21. As always, we thank you all for your patience as we work to improve the Blue Line. Be sure to follow us on Twitter @metroLAalerts for the latest service updates. For routes and schedule information visit metro.net or call 323.GO.METRO. Hopefully additional buses will be deployed since the LGBT Festival is taking place this week-end in Long Beach. I’m sure many attendees were hoping to use the Blue Line instead of driving for two reasons. Heavy traffic and parking plus many will be in no shape to drive home after the heavy partying that takes place there as with many other events in our area.